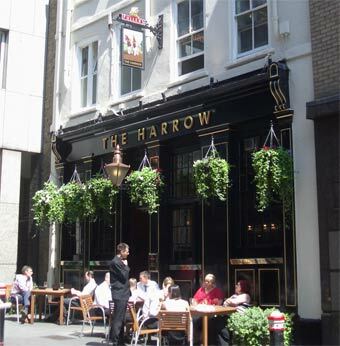 The Harrow has stood on Whitefriars Street for over 200 years, the traditional style English pub frontage is easy to spot and the sense of the history has not be lost on the interior. The main bar is accessed on the Whitefriars Street entrance, there is a much smaller saloon bar at the back, which can be accessed from Primrose Hill. Both bars offer traditional beer drinking surroundings, and the delight of London Pride, what more could you want from a City of London pub. The saloon bar at the back is reached from the main bar via some very steep stairs and was originally a tailors shop, but as business grow with the expansion of Fleet Street The Harrow was extended and knocked through to make the saloon bar, which must the shortest bar in the City. In the seventies The Harrow had outside gents in what used to be Hanging Sword Alley. The name of this alley was apparently a hangover from the days when Cavaliers were obliged to hand up their swords on entering a public house as a guarantee that they would not cause trouble. Large part of the allow were demolished under the 'Stopping Up of Highways (City of London) (No.6) Order 1970 and it has now long since been built over. It would have been just to the left of the pub as you faced it from Whitefriars Street.